One or two servings daily by active adults. It’s important to get enough protein to meet your individual daily requirements. Protein contains the essential building blocks (amino acids) needed for muscle energy, recovery and health. Consume a combination of high quality protein foods and supplements throughout the day and evening as part of a balanced diet and exercise program. Not for use by infants, children or pregnant or nursing women. Keep out of reach of children. For adult use only. Use only as directed. Do not purchase if seal is broken. Protect from HEAT, LIGHT & MOISTURE. BIN'sTM 100% CHXNTM is the New Gold Standard for a Real Chicken Protein Isolate Powder when a Higher REAL FOOD PROTEIN DIETARY SUPPLEMENT is wanted. BIN'sTM 100% CHXNTM Isolate can be added to your favorite beverage, food recipe or can be used alone, ​helping active adults to maintain peak performance.*. BINTM 100% CHXNTM CHICKEN PROTEIN ISOLATE. is a macro nutrient dense supplement that mixes easily with water or other beverages. 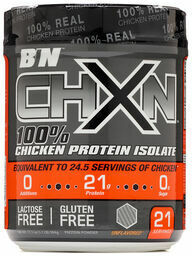 Achieve your protein needs to reach peak physical condition with BINTM 100% CHXNTM CHICKEN PROTEIN ISOLATE.